Treasure Mountain, a ski area in Park City, Utah, opened on December 21, 1963, with the longest gondola in the United States. The launch of this magnificent facility promised to bring the boom back to the quiet mining town. Park City, with its second bonanza in a century, was about to become a popular year-round destination. The opening of the Treasure Mountain Resort had a huge effect on bringing back life to Park City after the silver rush had subsided. 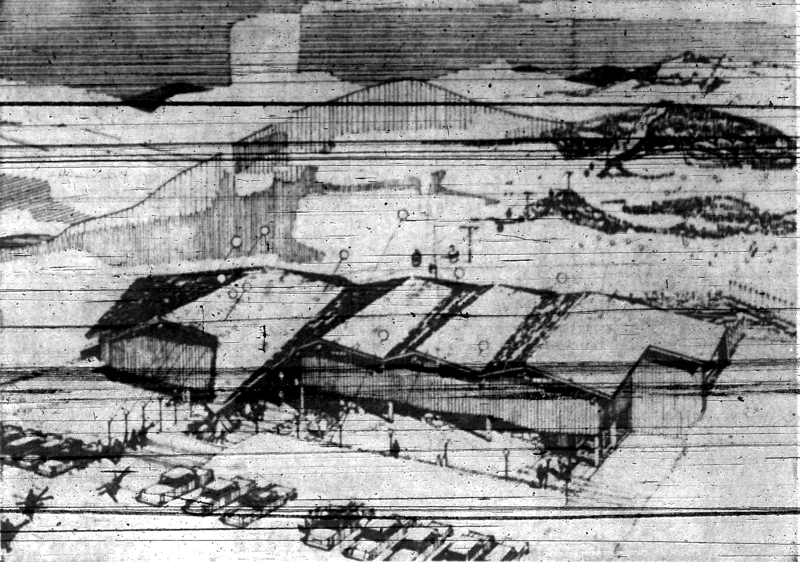 Architectural rendering that appeared with "Crews Alter Park City Scene," The Salt Lake Tribune, August 4, 1963. The new technology constructed in this mining town was awe inspiring to the local population. Rhea Hurley described the newest attraction: “The gondola ride is an experience ‘out of this world’ and must be taken to be fully realized and appreciated. One realizes they are not on a plane, nor a ‘flying machine’ of any sort, and are tempted to feel their shoulder blades to see if wings have sprouted while they are still here on Mother Earth.” (Hurley) The attraction of the gondola was revolutionary to the time and opened the doors to skiing much more terrain than before. Also, having the longest gondola in the United States prompted outdoor enthusiasts from around the country to come enjoy the new Treasure Mountain. Park City evolved through the building of Treasure Mountain. Although there were already hills to ski, the introduction of the United States’ longest gondola, the Treasure Mountain center, ski school, and other attractions brought a pulse back to the slowly fainting silver mining town. “The storied village offers skiers and sightseers a gay mood which is a carry over from its famous boom town mining days. Remember December 21, 1963. It’ll be an historic event for Park City, Utah and the intermountain area.” (“Local News”) That day proved to be the beginning of a skiing dynasty in the West, with Park City at the top of it all. Natalie Durham Hawkes is a senior at The University of Utah, graduating in mass communication in 2012. Mike Korologos, “Crews Alter Park City Scene,” The Salt Lake City Tribune, August 4, 1963. “Gondola Lift Rolls Today,” The Salt Lake City Tribune, December 12, 1963. Mike Korologos, “Park City Tramway Carries Pay Load,” The Salt Lake City Tribune, December 13, 1963. “Local News,” The Summit County Bee & Park Record, December 19, 1963. Rhea Hurley, “Stupendous, Unbelievable Treasure Mountains Consensus,” The Summit County Bee & Park Record, December 26, 1963. David Hampshire, et al., A History of Summit County (Salt Lake City: Utah State Historical Society, 1998). Raye Carleson Ringholz, Diggings and Doings in Park City (Salt Lake City: The University of Utah, 1970). “A Little Park City History,” Old Town Guest House. Philip F. Notarianni, “Park City,” Utah History Encyclopedia, The University of Utah. “Treasure Mountain Inn,” Park City Real Estate. “Park City, Utah,” Western Mining History : Reliving the Industrial Revolution of the West. The Rocky Mountains have given Utah a resource for recreation and have become a selling point for tourists from all over the globe. Skiing has a long history in Utah and started gaining national and global recognition around the start of the 1970s. Resorts started to spring up in the mountainous areas in the northern and southern ends of the state, joining the veteran resorts such as Alta, Brighton, Park City, Snowbird, and Brian Head farther south. The Deseret News made an effort to attract both local and non-resident skiers to come get a piece of the action. Prior to the Utah ski industry boom “ tourism expenditures increased over 30 percent in the Rocky Mountain Region in 1960-65,” which was a good indication that there was a bright future for a ski industry in Utah. (Rugh, 447) The impending revenue that was on the horizon forced Utah’s government to look into expanding ski resort accommodations and facilities in order to handle an expanding cliental. Skiing presented a new industry for the local government to develop and visibility in local newspapers played a major role in the development. An article in The Western Historical Quarterly describes how state branding helped in “Utah’s transformation from a rural backwater to a world player in the tourism enterprise.” (Rugh, 446) The coverage of the booming ski industry in The Deseret News during the early 1970s displays boosterism tactics that attempted to help bring people up to the Rocky Mountains to experience the expanding facilities offered by the numerous resorts. The Deseret News has delivered the news in Utah since 1850, following Utah through many changes and advancements. (Lythgoe) The growth of the ski industry in Utah and the revenue it brought in through tourism was a topic covered in the countless pages of grey paper. Looking at articles in The Deseret News during the beginning of the 1970s gives insight into how the paper attempted to bring people from outside the state and local skiers to Utah resorts as they expanded to new heights. In 1970 the ski industry in Utah was reaching new revenue heights in the millions and the local economy was cashing in. The number of visits to ski resorts doubled between 1966 and 1971, from 442,000 to an estimated 862,000. (Wikstrom, 219) An article published in The Deseret News on March 24, 1970, noted that “new [ski] facilities are much needed” as the number of skier increased. This article voiced the need for the expansion of resorts and developments in new areas. There was a long skiing heritage in Utah, dating back to the first resorts established in mining territories like Brighton and Park City in the late 1930s and early 1940s. Despite the skiing history the amount of non-local recognition was small and the mountains were utilized mostly by locals through the 1960s. The Deseret News reported on December 11, 1970, that actor Robert Redford had felt the power of the Rocky Mountains. The article describes a written feature including photos by Robert Redford about skiing in Utah and the treasures it offered, noting that the “vast Wasatch range have remained undiscovered by the majority of skiers.” The feature, “Robert Redford on Skiing in Utah,” displayed color pictures of the locations offered in Utah with descriptions of each area. This article gave Utah a well-known voice that advocated venturing to the ski resorts in the state. The Deseret News on December 17, 1970, reported that the Intermountain Ski Instructor Association honored a local ski legend, Sverre Engen, for his work as a teacher of the sport and an early filmmaker of Utah skiing. He was an advocate of bringing people to Utah for the skiing locations and was praised in the article by stating that the “Wasatch wonderlands have never bad a better booster.” This article shows that movie stars and local skiing legends were both promotional selling points utilized by The Deseret News. The Rock Hill Herald reported on March 12, 1971, about Snowbird’s new accessibility through a tram system that was the “ first tram in Utah and one of the largest in North America.” The article described the difficult accessibility of the mountain when it stated that it had been “popular with ski buffs affluent enough to use a helicopter as a chairlift.” The article also described the huge lodge projects that were being erected in Little Cottonwood Canyon stating, “Snowbird’s building program will accommodate 5000 people,” which showed the promise of further expansion in the ski industry. An article published by The Deseret News on November 27, 1971, noted that “for visitors skiing is believing.” The article quoted then American Airlines president George Spater claiming that when “ a skier comes back from Utah and tells his friends about great skiing, they listen.” This was one of the first relationships between airlines and ski resorts. Spater continues saying that “ the proposed merger with Western Airlines would strengthen American’s ability to attract more people to Utah.” Gaining the support of airline companies in marketing and advertising gave Utah’s ski industry an new ally that could prove to be valuable in bringing people to the state in order to utilize the local ski resorts. The Deseret News published an article on April 5, 1972, noting that skiing was perceived as the “least impressive recreation in Utah.” The comparison against other neighboring states put Utah below neighboring states on the list of recreational tourism location. The message in the feature suggested that a new image and promotional efforts were necessary for expansion in Utah’s ski industry. The Deseret News reported on November 2, 1972, that “getting up the mountain is a snap” and recreation in Utah is a great ski location. The article noted resorts like Alta, Park City, and Park West along with the more southern region, and reported that “Robert Redford dug the area so much he put a ski resort there.” The Deseret News played a part in 1972 in attempting to change the state’s image in order to draw new skiers to Utah slopes. An article published by The Deseret News on February 5, 1973, reported on the ski industry’s business growth. The article quotes Al Geibel, owner of the Rustler Lodge at Alta, who stated, “business is good—very, very good.” Geibel goes further and claims that “almost 100 percent of new business has been from out of state,” which helped pay for the new lodges that were under construction at the time. The article shows how different articles in The Deseret News were attempting to provide a positive image for the ski industry and Utah in general. The increasing business occurring in the Utah ski industry was reported by The Deseret News on November 23, 1973, noting that “Utah’s ski industry showed a net profit of $18,000,000, in 1972.” This rise in profits and Utah Ski Association’s nationwide recognition showed that the industry was on the right track. The article also noted that non-resident skiing visitors “ increased 40 percent.” The article also hopes that resorts don’t “turn their collective backs on the all-important local skier.” This article shows the upswing in the ski industry and its contribution to Utah’s economy while keeping focused on local ski enthusiasts. Looking at the move toward a successful ski industry, The Deseret News reported on September 15, 1973, that Utah’s ski industry “has been discovered” and will continue to prosper. The ski conditions of the Rocky Mountains were noted as “another factor in Utah’s ski success.” The article also shows how the airlines profited, stating that their revenue had grown “as much as 300 percent in skier traffic this past winter,” showing the symbiotic relationship between the industry. The feeling of the article is that Utah skiing had finally arrived and had a bright future. My research on The Deseret News coverage on the ski industry was focused on the progression of the industry. 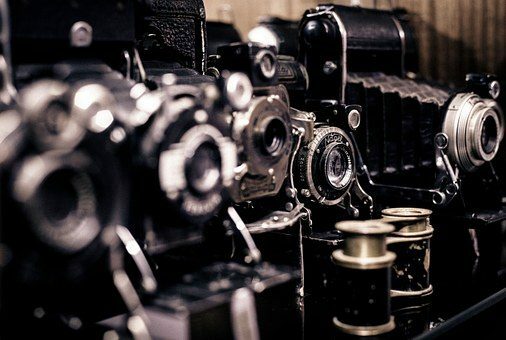 Although the media aren’t always the driving factor behind industries, the ski industry was impacted by the newspaper’s coverage directed toward local and non-residential skiers. The Utah ski industry utilized the resources at hand and created an industry that continues to flourish. The Deseret News’ coverage of this development played a part in gaining support for the expansion of the industry on a local and non-residential level. The cooperation of the airlines and publicity drawn from Redford’s feature and local skiing legend Sverre Engen helped boost Utah’s ski industry to a new level. Dakota Hawks will graduate from the University of Utah in August 2010 with a degree in mass communication. He is a snow fanatic. Arnold Irvine, “Leisure Manufacturing Big In Utah,” The Deseret News, March 24, 1970, A17. Hack Miller, “Ski Feature Boosts Utah,” The Deseret News, December 11, 1970, B9. Hack Miller, “Skiers Honor Sverre,” The Deseret News, December 17,1970, D1. Bill Hill, “Snowbird Rises on Wasatch Slopes,” The Rock Hill Ledger, March 12, 1971, 15. Arnold Irvine, “Visitors: Skiing is Believing,” The Deseret News, November 27, 1971, 27. Arnold Irvine, “Vacation in Utah? Poll Says ‘Unlikely,’” The Deseret News, April 5, 1972, 8b. “Utah Has Desert Image,” The Deseret News, November 2, 1972, 6f. Robert Buckhorn, “’Utah’s Really Arrived,’” The Deseret News, Febuary 5, 1973, 10B. Rolf Koecher, “Utah’s ski snow a hot item these days,” The Deseret News, September 15, 1973, 1B. Dave Kadleck, “Yes, Virginia, Utah’s skiing is on the move,” The Deseret News, November 23, 1973, 2C. Susan Rugh, “Branding Utah: Industrial Tourism in the Postwar American West,” The Westerm Historical Quarterly (2006): 445-472. Dennis Lythgoe, “Deseret News,” Utah History Encyclopedia.